Experts from PricewaterhouseCoopers (PwC) have suggested ways for ASEAN to get over the era of passive growth, lure more foreign direct investment, and develop human resources on the sidelines of the ongoing World Economic Forum on ASEAN (WEF ASEAN) 2018 in Hanoi. “Going forward, we see significant growth opportunities for the private sector across a number of industries in ASEAN. However, given the dynamics and challenges of ASEAN, along with the ever evolving and demanding needs of consumers in the region, companies will need to adopt innovative strategies to succeed,” said David Wijeratne, Partner and PwC’s Growth Markets Centre Leader from Singapore. Since its inception, ASEAN has not only doubled its membership, but has successfully weathered both the Asian financial crisis of 1997 and the global economic crisis of 2008–2009, to become the sixth-largest economy globally. Along this remarkable growth journey, ASEAN has managed to balance economic growth with human development to lift millions of people out of poverty across the entire region. However, a number of challenges, including a slowdown in short-term economic growth, weak labour productivity, an ageing population, an over-dependence on external trade and major voids in infrastructure and national institutions raise questions about the sustainability of ASEAN’s growth story. In order to progress from an era of passive growth and fulfill their true potential ASEAN nations need to take more proactive measures to continue to attract investments, develop institutions, and evolve people and technological capabilities. The private sector will also have a major role to play by working more closely with governments to develop the right conditions for businesses to prosper. According to Wijeratne, as many ASEAN member states are facing population ageing, the bloc should provide its workers with opportunity to develop their skills to get higher wages. As one of the countries with ageing population, Vietnam needs to take measures to increase the participation of women and the ageing workers in the workforce, he said. Strengthening the partnership between the private and public sectors is required to create more job opportunity the young labourers in Vietnam while these people need to be equipped with better skills to allow the country to go further in attracting foreign investment, he noted. Echoing his view, General Director and Partner of PwC Vietnam Dinh Thi Van Quynh said, despite the robust economic growth, Vietnam’s GDP per capita is not high in the region and ageing population is also among the country’s big challenges. The digital economy is thriving so the workforce must be provided with better skills. Vietnam has been relying on cheap labour which is now no longer an advantage, she said. To improve labour productivity and move up the global value chain, Vietnam should spend more on technology and education to develop its human resources, she added. 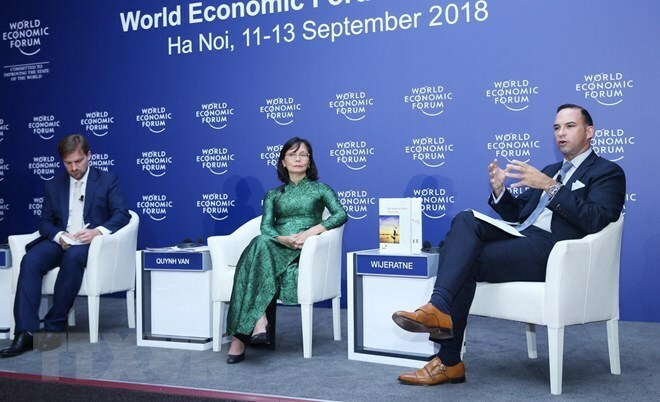 The WEF ASEAN 2018 opened in Hanoi on September 12. Themed “ASEAN 4.0: Entrepreneurship and the Fourth Industrial Revolution”, the event has attracted leaders of many ASEAN countries and partner nations, over 1,000 delegates who are also WEF members, as well as representatives of businesses from around the world./.